them all - linguistics. Using a methodology which has much in common with descriptive linguistics, they offer a lucid and wide-ranging account of how forms of language are used in communication. Their principal concern is to examine how any language produced by man, whether spoken or written, is used to communicate for a purpose in a context. 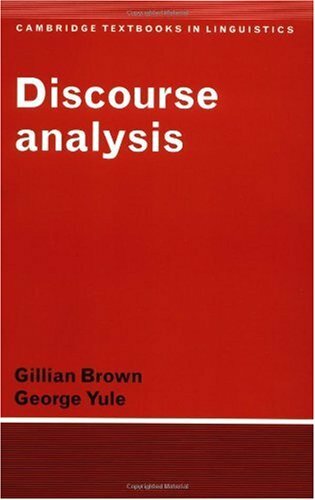 The discussion is carefully illustrated throughout by a wide variety of discourse types (conversations recorded in different social situations, extracts from newspapers, notices, contemporary fiction, graffiti, etc.). The techniques of analysis are described and exemplified in sufficient detail for the student to be able to apply them to any language in context that he or she encounters. A familiarity with elementary linguistics is assumed, but the range of issues discussed in conjunction with the variety of exemplification presented will make this a valuable and stimulating textbook not only for students of linguistics, but for any reader who wishes to investigate the principles underlying the use of language in natural contexts to communicate and understand intended meaning.